Every Avengers fan knows Hawkeye. He's the one with the bow and arrows! He may be a supporting character who'll never have a solo movie of his own, but as played by Jeremy Renner, he's a memorable presence and solid backup hero. He also has a largely-unrevealed history with Black Widow, which many fans took to be at least somewhat romantic until he was revealed to be a family man in Age of Ultron. The Hawkeye of Marvel Comics, however, is a whole different guy. Movie Hawkeye is a career spy (and probably professional assassin) with a pretty serious demeanor and a stable life outside the Avengers. Comics Hawkeye has another career history, background, and personality. He may look the same, but even that is a relatively recent development. So for those who may not know him, here's an introduction to the Hawkeye that Marvel Studios would just as soon you forget. Whether in the comics or the movies, everybody knows how Hawkeye dresses: black body armor, sometimes highlighted in purple, often with short sleeves. He wears no mask (who needs a mask these days? ), but sometimes there are sunglasses involved. It's a fine look, fitting for a spy/assassin turned superhero. However, fans who've been following the character since before 2012 and The Avengers still remember a very different-looking costume. 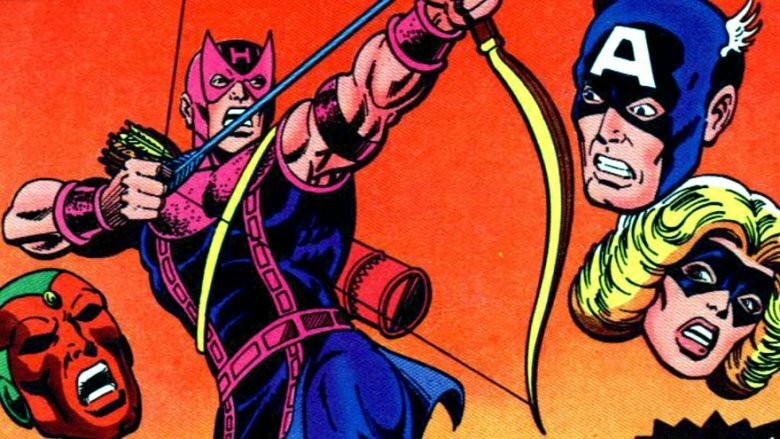 Hawkeye's classic costume, an evolved version of his original costume from Tales of Suspense #57, is a vibrant purple and blue. It features a Wolverine-style mask with a point above each eye, and a costume that contains elements of a medieval archer's outfit, down to the tunic that hangs over his waist and the folded-over buccaneer boots. It's very similar to what comics' other famous archer, Green Arrow, has traditionally worn, although more recently he's also been seen in simplified body armor. The body-armor-and-sunglasses look originated in The Ultimates, a 2002 reboot of The Avengers by Mark Millar and Bryan Hitch, which was set in a modernized continuity and featured more realistic visuals that inspired a lot of the Marvel Cinematic Universe's aesthetic. 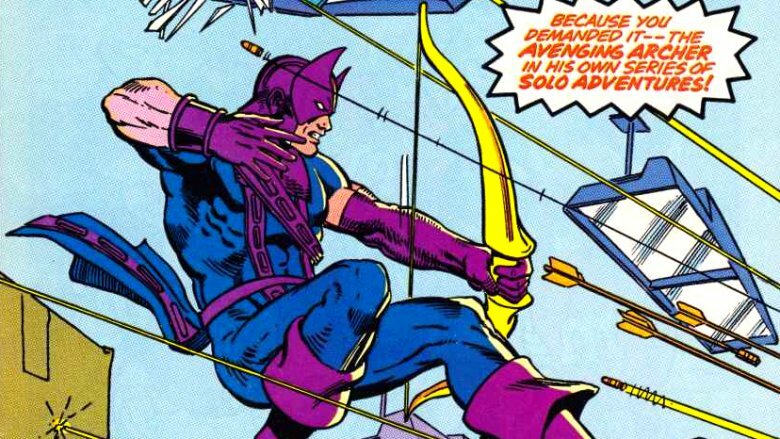 After the suit was popularized in The Avengers, the regular Marvel Comics version of Hawkeye switched to it as well. Obviously making fun of people for their line of work isn't a cool thing to do, especially when it has class implications. Still, you can't engage in popular culture and not notice that carnies — traveling folks who work for circuses and carnivals — don't have the greatest reputation. The public's general mistrust of itinerant people, combined with a long history of rigged carnival games and sideshow fakery, makes that reputation easy to understand even if it's not entirely fair. 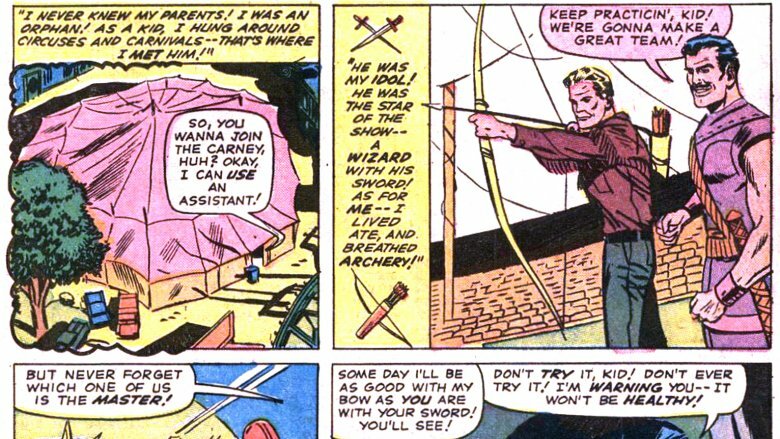 In any case, although it's never come up in the Avengers movies (where it might still be true, given how little we know of his backstory), Clint Barton grew up traveling with circuses and carnivals, along with his brother Barney. It was in the circus that Clint first learned the archery skills that would enable him to become Hawkeye. He was trained by the weapons expert known as the Swordsman, according to that character's first appearance in Avengers #19. Years later, Solo Avengers #1 would introduce Trickshot, a master archer who had also trained Clint during his circus days. Despite his lowly beginnings as a young carnival worker being trained to shoot arrows by supervillains, Clint Barton found he had a knack for it that soon made him one of the best archers in the world. Clint wanted to be a superhero from the beginning, it's true. In his first appearance in Tales of Suspense #57, he witnesses Iron Man in action and decides to become a costumed hero himself, using his unparalleled skills with a bow and an arsenal of trick arrows. Unfortunately, his first outing goes very badly, making him the prime suspect in a robbery and convincing Iron Man and the cops that the purple-clad archer is a new supervillain on the scene. Left with few options, Hawkeye lives up to his reputation and becomes a costumed criminal. 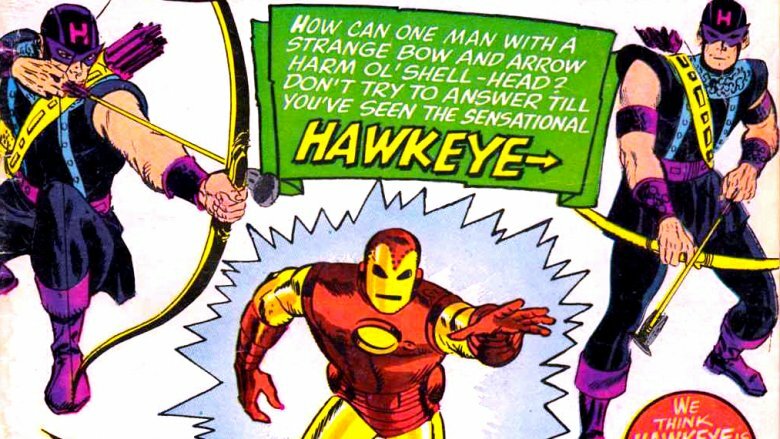 Prior to joining the Avengers, all of Hawkeye's appearances were as an enemy for Iron Man, albeit a surprisingly sympathetic one. When he did join the team in Avengers #16, it was alongside two other young supervillains who wanted to go straight. Quicksilver and the Scarlet Witch were former members of the Brotherhood of Evil Mutants, and along with Hawkeye they proved their worth as heroes under the watchful eye of team leader Captain America. Prior to joining the Avengers, when he was a young would-be hero who'd found himself railroaded into becoming a villain, Hawkeye met a girl. She wasn't just any girl, but a Soviet spy and already-established Iron Man villain known as the Black Widow. Although Hawkeye was at heart a true American, he was seduced by the beautiful Russian into becoming her partner in stealing technological secrets from industrialist Tony Stark. The two were inseparable for a while, menacing Iron Man despite their shared lack of high tech armor or actual superpowers. Black Widow would also become a hero in time, defecting to the United States in Avengers #29 before becoming an ally to Daredevil and finally joining the Avengers herself years later. The Avengers movies have kept the idea that Hawkeye and Black Widow share a dark history, but there it seems to have more to do with immoral actions they took in the employ of the United States government, rather than actions they took against it. If you're a fan of the Avengers movies, one thing that might surprise you about the classic comics is that Hawkeye plays a role you probably associate with Iron Man: that of the team smartass. Back in the 1960s, all superheroes cracked jokes — it was part of the job — but Hawkeye was particularly harsh in his sarcastic jabs at his teammates. He even made fun of Captain America, who everyone else treated with reverence. 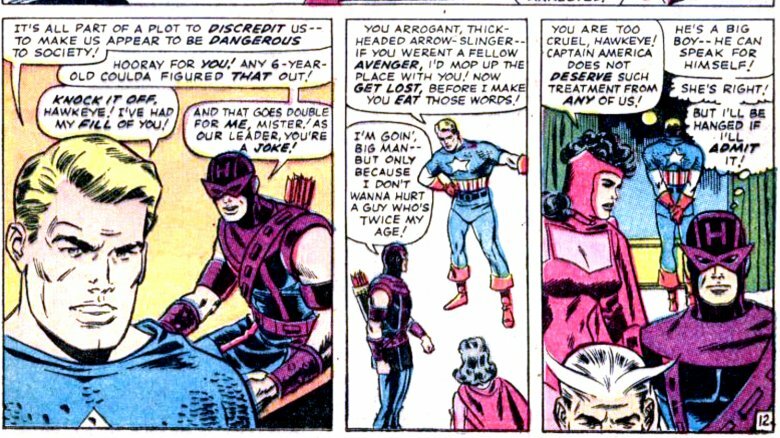 In those early Avengers comics, the two came close to trading blows a few times, just because of Hawkeye's bad attitude and smart mouth. Captain America generally gave as good as he got, and took it in stride. After all, during this era, steering former criminals unto a more heroic path was part of his job as Avengers leader, and Hawkeye's rowdiness was a part of that. Over time, Hawkeye learned to respect Cap, and the two became close friends. Hawkeye never gave up his sarcastic humor, however, and became known as both a playful jokester and sometimes an irreverent truth-teller who would deflate gasbags when needed. Iron Man, meanwhile, was always a pretty straight-ahead hero until the casting of Robert Downey Jr. brought his sense of humor to the fore. With the more staid Jeremy Renner in the Hawkeye role, it was only natural that their attitudes switched a bit for the Avengers movies. In Avengers #63, Hawkeye becomes understandably frustrated after his bow breaks at an inopportune moment. He begins to doubt his role as an Avenger, feeling that he's helpless without his preferred weapon, which isn't even effective against all enemies in the first place. 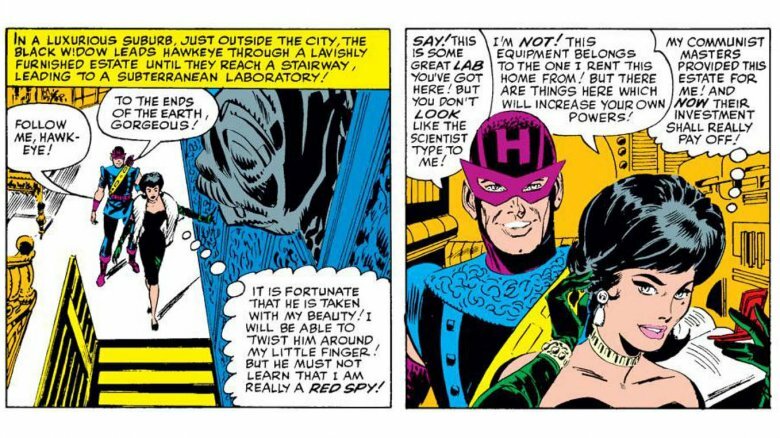 Conveniently, Henry Pym, formerly known as Goliath but now going by Yellowjacket, explains to the team that he'll only be shrinking from now on, as growing to giant size was exacerbating his psychological instability. 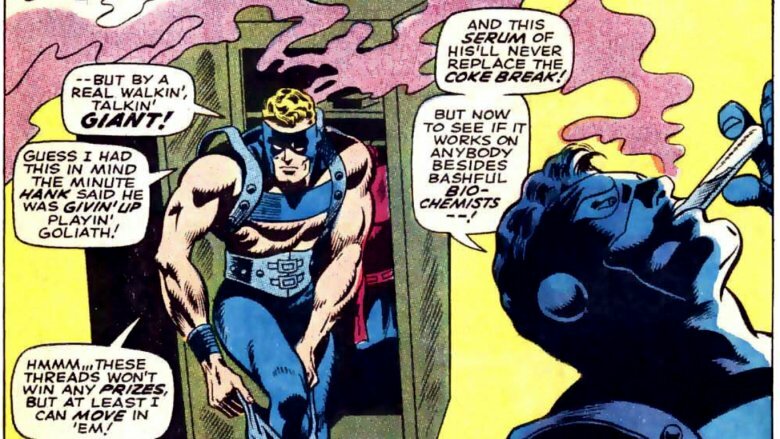 When the Avengers next rush into battle, Clint Barton leaves archery behind to claim the name, costume, and size-expansion serum of Goliath for himself. Clint remained Goliath for a couple of years. A giant seemed better to have around during the cosmic conflict of the Kree-Skrull war than an archer. Although he returned to the Hawkeye identity in Avengers #98, he's gone back to being Goliath a few times in the decades since. No matter what your powers or skills, it's always helpful to have a second, more physically powerful superhero identity in your back pocket in case of emergencies. When Clint returns as Hawkeye in Avengers #98, he doesn't go right back to the classic purple-cowled costume. Instead, artist Barry Windsor-Smith draws him in an all-new and pretty bizarre outfit. You could call it a tunic, charitably, but it covers even less of his heroic physique than that word implies. His legs are bare beneath the thigh-length skirt, while his muscular torso is revealed not only by a plunging neckline but by the garment's open sides as well. He also wears wrist bracers, a headband, and the usual purple buccaneer boots. 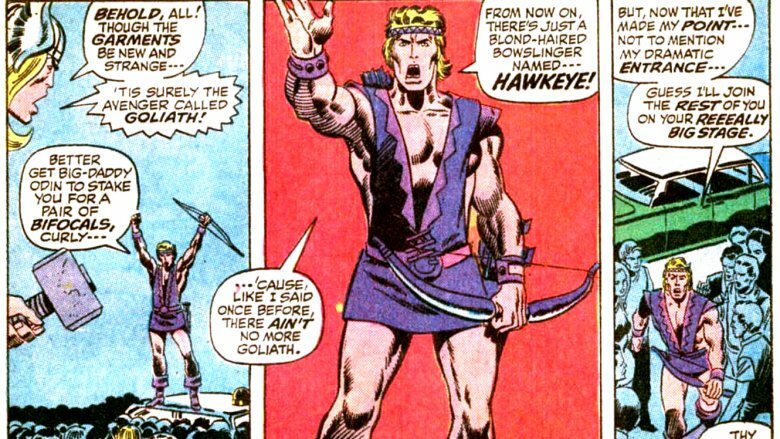 It would be unfair and unkind to make fun of Hawkeye for dressing in a manner usually associated with female characters. However, this costume is so unusual that it's simply hard to talk about it in any other terms. It's worth noting that Windsor-Smith was best known for drawing Marvel's Conan the Barbarian comics. In the ancient world of Conan, an archer would seem totally normal dressed as Hawkeye dresses here. In the modern world of Avengers, however, a guy like Hawkeye running around in something very much like a minidress just feels strange and out of place. Nevertheless, he would keep this costume for nearly a year, changing back to his classic gear just in time to quit the team in Avengers #109. In Avengers #502, Hawkeye sacrifices his life to take down a Kree warship after the incendiary arrows in his quiver were set alight in battle. Dying happens to every superhero sooner or later, and really it's just a matter of how long it sticks. For Clint Barton, it lasted until the House of M crossover, in which Scarlet Witch's powers remake the history of the Marvel Universe so that mutants are on top. Hawkeye is one of the heroes who helps set reality right again, even though he knows that he's dead in the reality he's helping to restore. Naturally he ends up alive when reality is restored to its usual order, although it takes him a while to reveal himself. He rejoins the Avengers in New Avengers #26, but not as Hawkeye. That name was taken over by a young hero named Kate Bishop while Clint was dead. Instead, Clint Barton takes on the identity of Ronin, a black-and-yellow-clad ninja that was previously the alter ego of a Daredevil supporting character named Echo. Clint's identity was kept secret as Ronin (something he'd pretty much given up on as Hawkeye), but he could no more stay a ninja forever than he did a giant, and he was Hawkeye again before long. 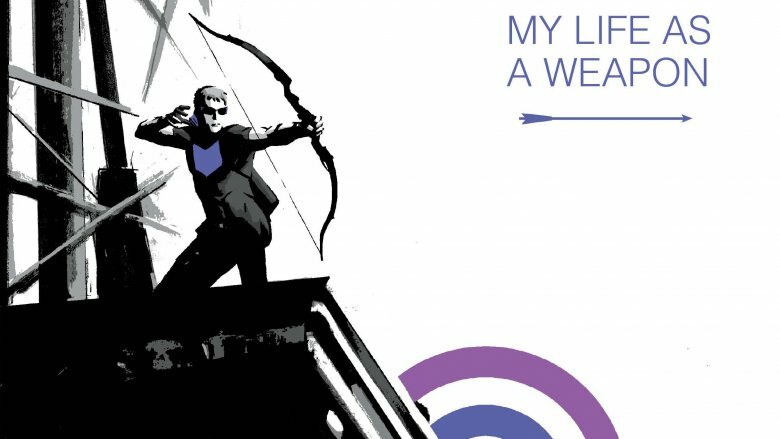 Much of Clint Barton's popularity among today's comics fans is attributable to a series that launched in 2012, written by Matt Fraction with David Aja as the primary artist. That book experimented with the superhero comics form to a degree that few Marvel books have before or since, and was highly praised for it. Fraction and Aja focus on a Clint Barton who understands that he's the most regular guy in the Avengers, and spends much of his downtime protecting the New York City apartment building where he lives and has found a sense of community among normal people. The series isn't completely devoid of supervillains, but Clint's main antagonists throughout it are a family of all-too-human mobsters who threaten his home. One thing that's easy to forget is that this comic, which changed how everyone thought about Hawkeye, only happened because he was in the Avengers movie. Prior to 2012, Clint Barton's only solo books were a handful of four-issue miniseries and a couple of attempts at ongoings that never made it past eight issues. 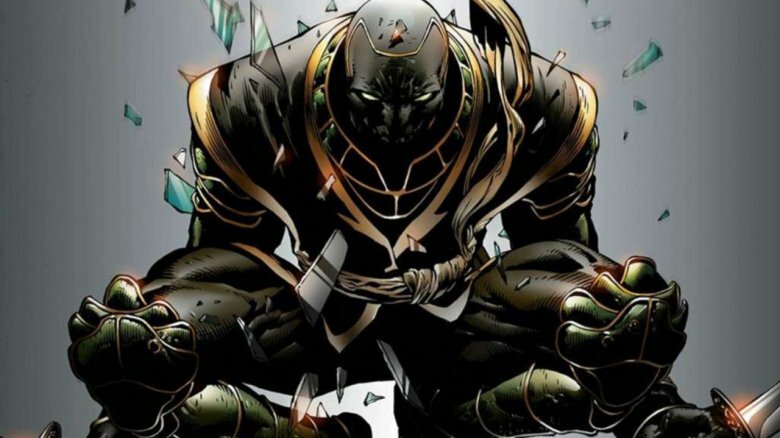 Appearing in Avengers, even in a supporting role where he was possessed by Loki for much of the movie and never displayed half the personality he has in comic, opened the door for a new series that highlighted his status as the most human Avenger, enabling Fraction and Aja to take that premise and run to really exciting places with it. Clint Barton now shares the name "Hawkeye"
When you mention Hawkeye these days, you may have to clarify who you're talking about. As mentioned above, a new Hawkeye rose up in the wake of Clint Barton's temporary death. 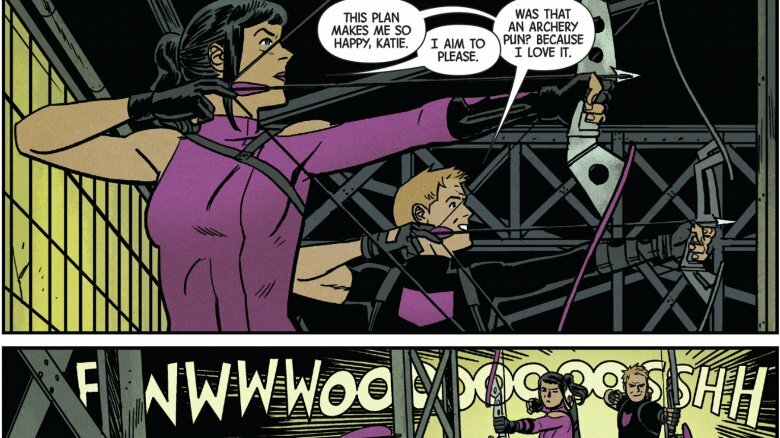 In the pages of New Avengers, a talented young woman named Kate Bishop became the new Hawkeye, complete with the bow, the arrows, and a purple outfit. When Clint returned to the Hawkeye identity, he encouraged Kate to keep the name as well, feeling she'd more than earned it. At the beginning of the Matt Fraction/David Aja Hawkeye book, the two work as partners, with Kate filling something like a sidekick role despite frequently seeming to have a better idea what she's doing than Clint does. Later in the series, Fraction and artist Annie Wu move Kate to Los Angeles, where she has her own series of adventures, while Clint remains in New York. This eventually set up a new Hawkeye series by Kelly Thompson and Leonardo Romero, in which Kate Bishop takes center stage as "the" Hawkeye, although Clint was around in other books at the same time. The nature of comic book storytelling means that the name Hawkeye will always refer to Clint Barton first, but the rise of Kate Bishop as her own Hawkeye displays how much comics have evolved in recent years, with a wider variety of characters catering to a wider variety of readers. Through his support of Kate, Clint Barton himself seems to support that evolution. For a character who's come so far since he was a carnival-based Iron Man villain in 1964, changing with the times feels totally natural.